The workplace is evolving rapidly, and employees have new expectations for work and how it should get done. Business leaders are embracing these changes and supporting a new culture of work . Having always-on access to files and data. Flexibility to work from wherever, whenever. Business leaders recognize that people are core to how each of their companies operate and it’s their imperative to empower their employees to innovate and grow in a competitive landscape. At the same time, companies are faced with the challenge of protecting their people and IP in a more complex threat environment. Companies are looking for solutions to enable a modern workplace for their employees. Our mobile phones are always with us and great for communication and light productivity on the go. Tablets are great for interacting with content (or reading on the couch). But when users really want to get work done, they choose their PC. Users want simplicity, flexibility and mobility. Users want access to the latest tools and for their PC to be an asset to their creativity. But IT’s duty is to ensure security and compliance, often at the expense of productivity. A modern desktop resolves this tension. IT can now deliver the experience users are demanding, while meeting their business obligations. What is a Modern Desktop? A modern desktop is Windows 10 and Office 365, kept up-to-date. 3. IT teams adopting a “stay current” process utilizing Windows and Office servicing to deploy regular security and feature updates. This combination provides the most productive and most secure computing experience for users while lowering total cost of ownership for the organization… all while reducing complexity for IT teams. Let’s take a look at each of these statements, starting with “most productive”. A modern desktop is for all customer types in all segments and the best way to get Windows 10 and Office 365 is via Microsoft 365. Information workers on average spend 6% of their time on the average work day just searching for information. 29 minutes per day may not seem like that much, but multiply that over a week, month, year over 15 full work days wasted… just looking for stuff. Enterprise search in Windows brings intelligent search right to users’ task bar, enabling them to find what they need faster – whether it’s apps, settings, documents, email messages, company resources, 3 web results, people, Power BI dashboards,1 and more. Enterprise search will surface results across local and cloud locations, with integrated options to take immediate action from the results. Focused Inbox in Outlook allows you to stay on top of incoming email without having to visit another folder, prioritize your actions based on email from the people you interact with often, and the content of the email itself, and focus on the emails that matter most to you. Researcher in Word lets users explore and research content without leaving Word, add relevant quotes, cit-able sources, and images to the document, and view related topics to the content being researched. Cortana acts as a personal digital assistant, helping people manage their schedules, commitments, and important tasks they need to remember day to day. Cortana syncs across phones, PCs, or tablets, enabling users to seamlessly move from one device to the next, and get their work done anywhere. Windows Timeline help users stay in the flow, giving them a chronological view of their activities and documents, so they can jump right back in where they left off on a project or document. 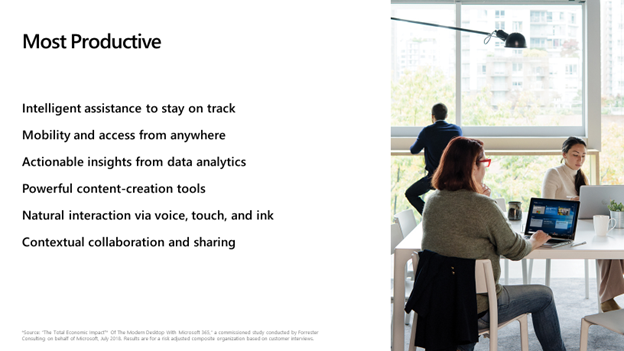 Access your work on any device and any platform: users can access Office 365 files and data from any activated device, anywhere, on any platform, at any time. They can share and collaborate on documents directly from OneDrive, and provide access to anyone in the organization. Users can now author and edit documents with voice dictation in Windows 10. Dictation will convert speech to text, so users can think freely without a keyboard. Co-author together in Word, PowerPoint, and Excel: collaborate in real-time in the same document, view where others are editing in the document, and receive alerts when people enter or leave the document. Flag critical actions and inputs with @mentions in Office documents: get peoples attention with @ in the body of a message or meeting invite, select from your contact list and automatically add to the To line, and search for messages that mention you. Never lose your work with Version History in Office documents: look back and understand how your files evolved over time, restore older versions in case you make a mistake, and quickly access documents you have worked on recently. With the new Nearby Sharing feature in Windows, meetings with co-workers just got easier. Using the Share option in Microsoft Edge, File Explorer, OneNote, and other Windows apps, users can quickly transmit documents, files, and web pages to nearby PCs via Bluetooth. So spontaneous sharing and collaboration can happen anywhere – not just in spaces equipped with a screen or projector. Microsoft Whiteboard gives users a digital canvas where people – in the same room, or collaborating remotely – ideas, and content can come together. Some businesses can have up to 50 security solutions to manage, which quickly adds up in costs and management of multiple, sometimes overlapping solutions. A typical security expert can only address an average of 10 alerts per day – that puts a lot of pressure on your security team’s bandwidth. Piling on more security solutions or hiring more security experts isn’t sustainable or fiscally responsible. Defend against malicious documents with ATP Safe Attachments. ATP Safe Attachments to check and see if email attachments are malicious, and then takes action to protect your organization. Ensure hyperlinks in documents are harmless with ATP Safe Links . ATP Safe Links can help protect your organization by providing time-of-click verification of web addresses (URLs) in email messages and Office documents. Protection is defined through ATP Safe Links policies that are set by your Office 365 security team. Ensure hyperlinks in documents are harmless with ATP Safe Links . ATP URL Detonation will now run a URL reputation check and analyze URLs in email for malicious behavior. When the URL is being scanned, users will see a yellow pop-up window with a message that says, "This link is being scanned". If Microsoft identifies the link as fraudulent, the user will see a red message box stating, "This website has been classified as malicious". Prevent data loss via built-in Policy Tips . Use Policy tips to help determine the right level of security controls to take including message encryption and multi-layer defense using multi-factor authentication to require two or more ways to verify sign-in transactions. Encrypt sensitive messages with Office 365 Message Encryption . Help reduce the risk of unintended disclosure by encrypting and rights-protecting email messages sent both inside and outside your organization. Embrace multi-layer defense with Multi-factor Authentication. Detect fast-changing malware variations with Windows Defender Antivirus . Antivirus protects against emerging threats as an enterprise-grade antivirus solution. Avoid compromised devices with Windows Defender System Guard . System Guard helps avoid OS tampering as it starts up, runs, and gets accessed remotely to avoid compromised devices. 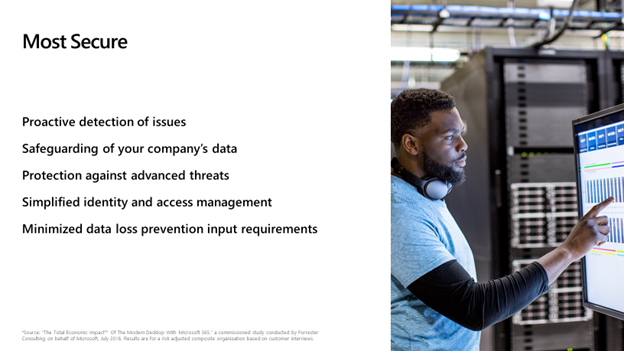 Protect endpoints from cyber threats with Windows Defender Advanced Threat Protection. Simplified identity and access management . Unlock your device with a look or a touch with Windows Hello . To simplify identity and access management, you get the extra security with modern devices using Windows Hello to log in faster using your camera to recognize your face . Isolate and protect credentials from a full system compromise with Credential Guard . Credential Guard also helps to protect hackers from taking over enterprise networks by storing credentials in a virtual container that cannot be accessed directly. Prevent accidental or intentional data leaks with Windows Information Protection. Windows Information Protection (WIP) to protect against this potential data leakage without otherwise interfering with the employee experience . WIP looks for inappropriate data sharing practices and stops employees from completing the action. This can include sharing enterprise data to non-enterprise protected apps or outside of your organization’s network. Encrypt sensitive information and protect against unauthorized access with Bit-locker. Bit-Locker is a data protection feature that integrates with the operating system and addresses the threats of data theft or exposure from lost, stolen, or inappropriately decommissioned computers. Provision, enforce, report compliance, and recover data with Bit-locker Administration & Monitoring . Application compatibility you can trust . 99% of Windows 7 apps will run on Windows 10. Use Windows Analytics to get detailed guidance and project recommendations for upgrading devices to Windows 10 and keeping them current . Readiness Toolkit for Office Identify potential compatibility issues with macros and add-ins. Windows as a service, which ensures users and devices are safe and productive with the latest feature and quality updates. This is the new semi-annual release cadence that supports the agile software model. To help in the upgrade from Windows 7 to Windows 10, In-place upgrades automatically preserves apps, settings and data so there is minimal disruption to the end user, and IT interaction. With Windows Update for Business you can update devices directly from the cloud, and specify which devices go first in an update wave, and which will come later. This allows time to test and validate feature updates and enables you to create internal deployment groups. Express updates and delivery optimization reduce the load on your network, which is very helpful for limited bandwidth scenarios. Windows Autopilot . Get new devices up and running fast, without re-imaging, all powered by the cloud. The hero feature here is Windows Autopilot, which allows IT to get new devices up and running fast, without re-imaging, all powered by the cloud. Automatically configure settings, security policies and install apps like Office 365. Windows Autopilot takes new device from the box to fully configured and managed from the cloud, with minimal IT, or end user effort required. Powered by Azure Active Directory and Microsoft In-tune it automatically configures settings, security policies and installs apps like Office 365 apps. 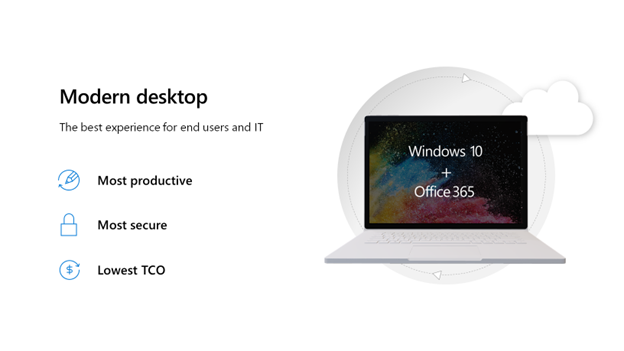 Windows 10 plus Office 365, kept up-to-date, gives users the most productive and most secure computing experience, with the lowest TCO. As per Forrester Study, for Modern Desktop, there is 13 month payback. 40% lower security risk. 2.3 hours saved per week per user. Support for Windows 7 will end on January 14, 2020. And in October 2020, extended support for Office 2010 also comes to an end. Configure the free Windows Analytics service to create a detailed view of the of the PCs and devices in your organization and their readiness for Windows 10 . Use the Readiness Toolkit for Office to understand if add-in/macro compatibility work needs to be done in order to migrate to Office 365.